I haven’t done a tutorial in ages so why not do a celerity inspired one instead to get back on track? I recently promised ill do a tutorial on Aishwariya rai’s look which she wore with her grey Elle Saab. I love this look and I’m sure most you would do as well. a grey Smokey eye is Aishwariyas signature look and this is the same case with a slight pop of antique gold. Hope you enjoy! Have you already entered my NYX nail polish giveaway? Apply a base and apply a little bit of kohl all over the lid area. Make the kohl really faded so that it looks grey- ish. Apply a darker grey shade on the outer V area to define the eye. Using a fluffy blending brush, pick up a matte brown shade and lend the harsh edges to create a diffused look. Using a shimmery champagne shade, place it in your inner corner and also highlight your brow bone. 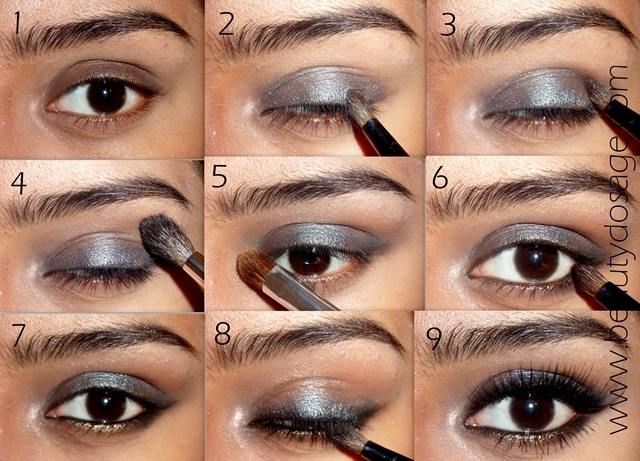 Apply black kohl on the outer half of the lower lash line and smoke it out with a matte black eye shadow. Using a dirty gold shade and apply it over your lower lash line and blend it with the smoked black, if your pigments or eye shadow isn’t intense enough, wet it with some water. Line your upper lash line with black kohl and smoke it out with the same matte black shadow. This method of lining gives the eyes a sultry look. Finish of your look with mascara and falsies! Curl your real lashes with your false ones for them to bond. Hope you try this look out and do give me your feedback on the comments below! Wow! such a great tutorial..
Wow this is perfect jeeshan!! !